On this page you will find an ever growing catalog of coins from every corner of the globe. This section takes over where the ancients and middle ages left off. These coins represent significant evolution in the coin making progress. This section is devoted to coins that were minted as official currency of a sovereign nation be it a modern nation state, empire, kingdom, principality or a duchy. These coins were minted to be circulated and used as a medium of exchange for goods or services. The purpose of this section, as is the purpose for all the different sections of this site, is not just to document the coin but in most cases there is an attempt to place the coin in an historical context. All of these pages offer the basic information about a coin: where it is from, what it says and depicts, when it was minted, value, physical characteristics as well as other specifics about the coin itself. Many of these pages also offer broadly expanded historical information about the time period and the place where the coin was issued and used, biographical and documentary information about who or what is depicted on the coin or significant events that took place contemporary to the coins issue and use. 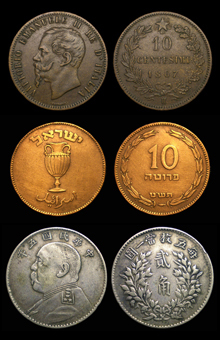 We are constantly adding new examples of coinage in an attempt to present a thorough cross section of world coinage from different moments in time and from a variety of nations.